We’re proud to announce that Capterra, a service that ranks software, has once again rated us the #1 Membership Management Software on the market - that’s 3 years in a row for us! (and hopefully many more to come). You can see the list of all top 20 here. Keeping our #1 ranking is a great accomplishment for us. We certainly didn’t stumbled into the top position by accident. Those of you who have been with us from the beginning know that we’ve always worked our darndest to offer you the most value. Want to request a new feature? Offer some praise? Even tell us your beef? Whatever it is, we're always listening. We take all our feedback seriously and have opened many channels of communication for you to get in touch: email, surveys, our UserVoice Wishlist forum, and our always-ready (and super friendly) support team. So, just what do we do with all the feedback we collect? 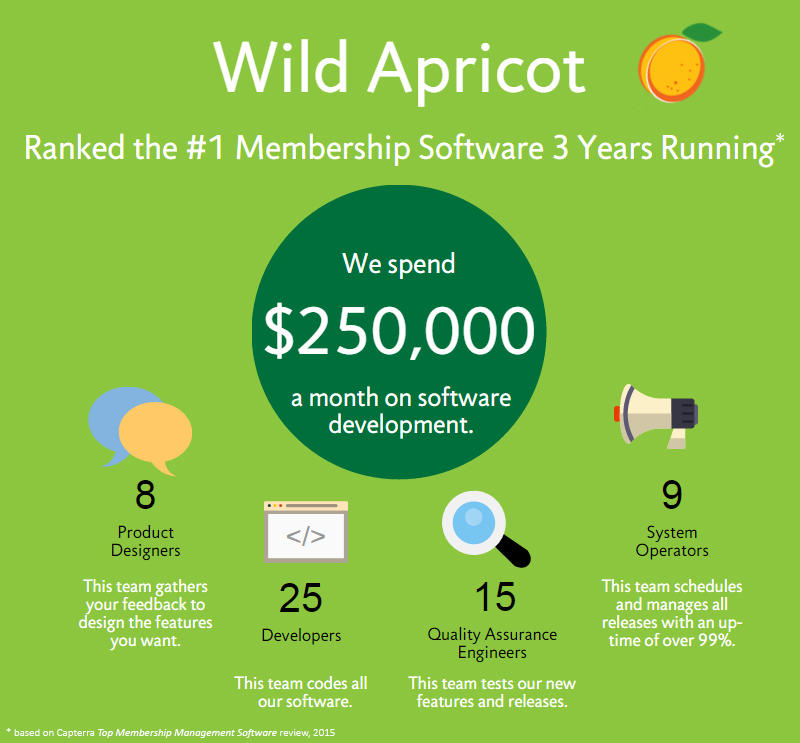 We use it to improve our software and give you a better experience with Wild Apricot. Speaking of improving our software, since 2006 we've published 64 major releases, offering hundreds of new requested features. Through the years, we’ve offered a multitude of free educational resources. From our Knowledge Hub Articles, Podcasts, Courses, and Expert Webinars, we’ve helped thousands of nonprofit professionals learn valuable skills that have helped them to grow their organizations. And because free education has been a key helper to success, we’re not going to slow down. You can expect more high quality education from us in the future! I must say, it also feels good from our end to know that our hard work has paid off. BUT! We don’t want to take this award and call it a day, we're going to keep striving for #1! Going forward, we’ll continue to collect your feedback, improve our software, and help you grow through education. This means that you can keep looking to us as the preeminent guide for membership software and education and be happy that you’ve made the right choice in trusting Wild Apricot to help manage your organization. Thanks for 3 fantastic years as #1! Here’s to another!